Application to build a state of the art Resource Recovery and Renewable Energy Production Facility (the 3Rs Facility) on Fryers Road, Leamore Lane Industrial Estate, Walsall generating 20 Megawatts of renewable electricity and up to 50 jobs. BH EnergyGap’s partner Keith Riley has welcomed the decision by Walsall Metropolitan Borough Council’s planning committee to grant permission for the 3Rs facility, which the company has named The WandE. As a new application was required to provide a more viable and workable design solution, BH EnergyGap took the opportunity to improve the development, providing enhanced architecture and environmental features for the canal, wildlife as well as electric vehicle charging points. “The 3Rs facility will provide a much needed local resource for businesses to help them meet their landfill diversion targets at a competitive price with a combination of materials and energy recovery on one site. It will also be a real boost to the local economy in terms of jobs and support services in these difficult times.” said Riley. 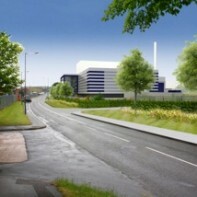 The 3Rs facility is designed to take industrial and commercial waste from the surrounding area. It will have an extensive materials extraction facility to recover recyclables and utilise energy recovery for the remaining waste. This advanced thermal treatment technology, known as Gasification, will produce a gas from the prepared feedstock, which fires a boiler to produce electricity. It does not burn the waste itself. This facility therefore meets the best practice of modern waste management. To operate the 3Rs facility an Integrated Pollution Prevention Control (IPPC) permit will be needed before the facility can open. An application will now be made to the Environment Agency (EA) in the next few months. Once approved, and the facility is operational, the 3Rs facility must comply with stringent controls which will be monitored by the EA for the life of the facility, along with continuous monitoring and reporting undertaken at the 3Rs facility. BH EnergyGap, a partnership established to address the shortage of renewable energy in the UK, has know-how in developing sites, planning, contracting, selecting state of the art technologies and waste management expertise. As the cost of waste disposal continues to rise, there is ever more pressure on businesses to ensure their waste is properly recycled and processed and not sent directly to landfill. However, there is a real shortage of facilities to support the local business community in delivering best practise waste management.